There are 26 Assisted Living Facilities in the Puyallup area, with 9 in Puyallup and 17 nearby. The average cost of assisted living in Puyallup is $3,130 per month. This is lower than the national median of $3,346. To help you with your search, browse the 109 reviews below for assisted living facilities in Puyallup. On average, consumers rate assisted living in Puyallup 4.0 out of 5 stars. Better rated regions include Sumner with an average rating of 4.2 out of 5 stars. Caring.com has helped thousands of families find high-quality senior care. To speak with one of our Family Advisors about assisted living options and costs in Puyallup, call (855) 863-8283. Puyallup, named after a Native American tribe in western Washington, means “generous people," and Areavibes gives the city an A+ for its amenities, such as shops and restaurants. Puyallup also has nine assisted living facilities (ALFs) with 31 more in nearby areas such as Tacoma, Federal Way and Auburn. ALFs in Puyallup are governed by the Evergreen State’s Department of Social and Health Services (DSHS), Aging and Long-Term Support Administration (ALTSA), Residential Care Services (RCS) Division. The comfortable year-round climate in Puyallup consists of mild winters with an average low of 33 degrees Fahrenheit in January and cool summers averaging 78 degrees in July. This lets seniors enjoy the city’s urban forest, parks, golf courses, farms and other outdoor attractions and activities. Although Puyallup’s overall cost of living is 12 percent higher than the U.S. average, retirees can enjoy significant tax savings as personal income, social security, retirement benefits and pensions are state tax-exempt in Washington. Senior mobility is supported in Puyallup. Pierce Transit operates buses around Pierce County at reduced fares for passengers 65+ and offers shared-ride paratransit services. Riders 65+ pay discounted fares on Sounder train rides to Seattle. Seniors can also book private transportation to medical appointments and special events. The home of the Washington State Fair, Puyallup offers a rich arts and culture experience. Seniors heading downtown can enjoy a free walking tour of the Arts Downtown outdoor art gallery, check out fascinating finds at the Antique District and watch live shows at the Liberty Theater with discounted tickets for guests 55+. Museum passes give city library patrons free admission to select museums in Washington. The Puyallup area is home to world-class medical facilities including MultiCare Good Samaritan Hospital, MultiCare East Pierce Family Medicine, Pacific Medical Center and Summit View Clinic in the event of medical emergencies or illness. Puyallup is a member of the AARP Network of Age-Friendly Communities, meaning that its elected leadership “has made the commitment to actively work toward making their town, city or county a great place for people of all ages,” according to AARP. Assisted Living costs in Puyallup start around $3,130 per month on average, while the nationwide average cost of assisted living is $4,000 per month, according to the latest figures from Genworth’s Cost of Care Survey. It’s important to note that assisted living rates in Puyallup and the surrounding suburbs can vary widely based on factors such as location, the level of care needed, apartment size and the types of amenities offered at each community. 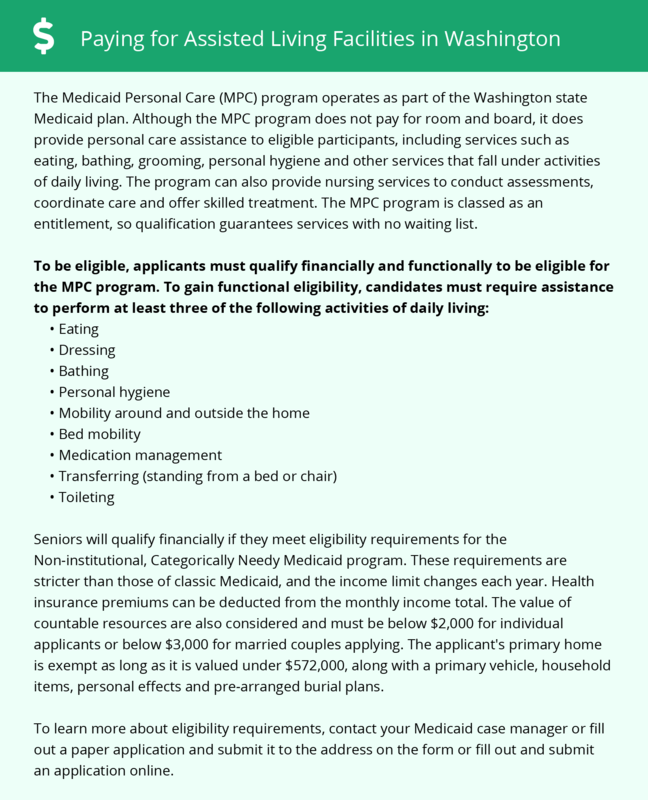 There are Medicaid programs offered by the state of Washington to pay for the cost of ALF services in Puyallup. Eligible seniors may qualify for the Community First Choice (CFC) State Plan or one of the Home and Community-Based Service 1915(c) waivers which are the Community Options Program Entry System (COPES), New Freedom and Residential Support waivers. To see a list of free assisted living resources in Puyallup, please visit our Assisted Living in Washington page. Puyallup-area assisted living communities must adhere to the comprehensive set of state laws and regulations that all assisted living communities in Washington are required to follow. Visit our Assisted Living in Washington page for more information about these laws.